hye korang,,, wah,, i started writing for this entry at 7.25 am,,,!!! unbelievable? believe it yooo,, wah,, ape ni,, huhuuhu,,, i found out about THIS WEBPAGE from AKAK MARIA ELENA OHSEM,, korang kenal kan,, alaaa,,, blogger suka buat muka hudoh walaupun cantik macam bebebidadariririri tula,,, happynya tengok KAK MARIA ELENA sekarang,, future bride-to-be la katakan,, hehehe..
she is my idol instead of britney spears,, hehehe..
i am enchanted by her instead of edward cullen,, huhu..
then,, dia ni ada CAREER TEST!!! Woowwww!!! a lawyer??? naaah,,, afraid to be at the bad side. 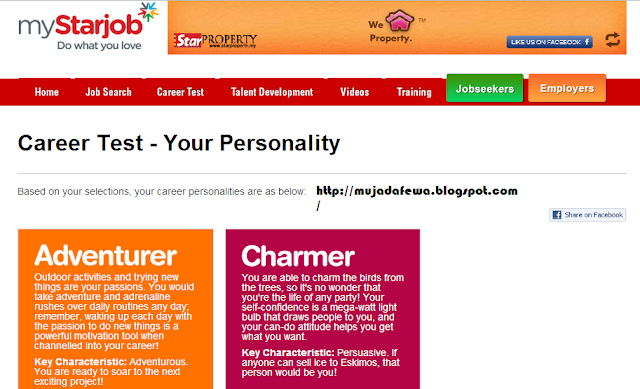 want to see what i should become according to the career test??? so,, for those yang still looking for jobs,, do visit MYSTARJOB,, rezeki ada di mana-mana but it depends on how we work to gain it,, chow!!! adios amigos!!! nak kerja.. nak kerja.. ngee..^_^ tq sharing..
sila terjah sesapa yg tgh nk cari keje..